Special Strain Relief Support design, can bear 10000+ bending test, protect the most vulnerable joint of the usb type c cable, Premium Aluminum housing adds the durability of the cable. Transfer data speed up to 480Mb/s, this allow you to download an HD movie or 1000 songs every 5 seconds. Charging speed up to 2.4Amps, this allow you to charge your phone in the fastest way. With the 6.6ft length, you can lie on the couch and use your devices while charging. And use freely in your bedroom, office and even in the backseat of your car. How convenient!!! Sturdy braided-nylon fiber jacket and anodized aluminum shell make this Type C cable more durable, more flexible and sturdier than the normal ones. Tangle-free cord design eliminates bunching, tangles, and knots. Complemented with a real leather cable tie that will come in handy for keeping the cable organized. Built-in 56k Pull-up Resistor, protect your device from potential danger. Military grade material : Strong military fiber, the most flexible, powerful and durable material, makes tensile force increased by 200%. Special Strain Relief design, can bear 10000+ bending test. Premium Aluminum housing makes the cable more durable.Premium nylon braided type c cable adds additional durability and tangle free. Fast Charging and Sync : Transfer speed up to 480Mbps, 2.4A Fast Charge, Data Transfer and Power Charging 2 in 1 USB-C Cable. This cable does support fast charging and we recommend using the original wall charger for your phone. Perfect 6.6FT : With the 6.6FT length, you can lie on the couch or sofa and use your devices while you are charging at the same time. And you can use freely in your bedroom, office and even in the backseat of your car. NOTE : Google pixel is equipped with C-port wall charger in official, so when you use USB C to A Cable or the A-port wall charger, it can only charge normally but can not support fast charges, because pixel is using Google's private charging protocol. If you want to charge quickly, you should use the pixel original C-port wall charger and C to C cable;This cable does support fast charging and we recommend using the original wall charger for your phone. What you get : We provide this 6.6ft Nylon Braided USB 2.0 Type-C Cable with worry-free 18-month warranty and 24/7 customer service. 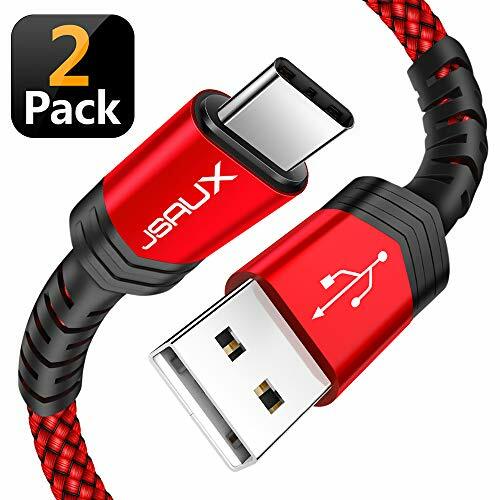 This USB C Cable can fast charge and sync well compatible with Samsung Galaxy S10 S9 S8 Note 9/8,Moto Z/Z2, LG G5/G6/V20/V30 and other USB C devices. Built with a standard 56K resistor and 23 AWG wire core to ensure safe charging to a maximum current of 3.0A. Manufactured in accordance to USB Type-C specifications version 1.1. User-friendly design allows you to plug into all USB-C Compatible devices without worrying about the connector/port orientation. Covered by a premium nylon-braided jacket. Durable build to withstand heavy usage and maintain optimal performance. ...and many more USB 2.0/3.0 compatible devices! USB CERTIFIED FAST DATA-SYNC & CHARGING (USB 2.0): Supports safe high-speed charging (5V/3.0A) and fast data transfer (480Mbps). *Not compatible with iPhone or Micro USB! DURABLE & TANGLE-FREE DESIGN: Features an ultra-durable nylon-braided jacket with a bend lifespan of 10000+ and seamlessly molded joints. REVERSIBLE CONNECTOR: Keeps up with the latest trend of USB interface. This user-friendly design allows you to plug into all your USB Type-C compatible devices without worrying about the orientation of the port. SAFE & RELIABLE: Manufactured in accordance with USB Type-C specifications version 1.1. Solid 23AWG wire core is housed within premium aluminum housing for safe and reliable charging up to 3A. Standard 56k pull-up resistor contained. WARRANTY: Extended 24-Month Warranty. Upgrade to our Lifetime Warranty by following us on social media. 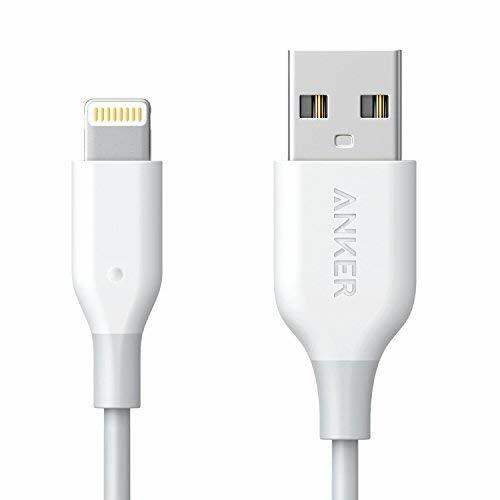 Power Line Lightning (3 ft.) The Fastest, Most Durable Lightning Cable From Anker, America's Leading Charging Brand Faster and safer charging with our advanced technology 30 million+ happy users and counting Heavy Duty for Heavy Use We reinforced Power Line with bulletproof fiber, then bent it over 5, 000 times and observed no damage or change in performance. Faster Charging With wide-diameter wires and reduced cord resistance, Power Line Lightning delivers the fastest charge any USB charger is capable of. Damage-Resistant Connectors A lengthened unibody design flexes with your cable, ensuring that the connector never gets crushed or detached. Apple MFi Certified Each Power Line cable contains a unique authorization chip of the latest kind issued by Apple to ensure 100% sync and charge compatibility with any Lightning device. This ensures faster speeds than non-certified alternatives. Worry-Free Warranty At Anker, we believe in our products. That's why we back them all with an 18-month warranty and provide friendly, easy-to-reach support. Works With: iPhone XS / XS Max / XR / X / 8 / 8 Plus / 7 / 7 Plus 6s / 6s Plus / 6 / 6 Plus / 5s / 5c / 5 iPad Air / Air 2 / Pro, iPad mini / mini 2 / mini 3 / mini 4, iPad (4th generation) iPod Nano (7th generation) and iPod touch (5th / 6th generation) Please Note: This cable is not compatible with LifeProof iPhone 6 / 6 Plus cases. It will fit LifeProof cases for other Apple devices as well as the vast majority of cases from other manufacturers. Ultra-Durable: Bulletproof fiber resists fraying and other damage. High-Speed Charging: Wide-diameter wires and reduced cord resistance maximize charge speed. Flexible Connectors: New extended, flexible connectors resist breakage for superior durability. What You Get: PowerLine Lightning, hook and loop cable tie, our worry-free 18-month warranty, and friendly customer service. 2. Support from both sides can be inserted "positive and negative insert" function, can withstand 10,000 times repeatedly plug. 3. With a free adapter and a drawing bag. 4.WARRANTY: For 18 months after the date of purchase, we take care of all quality-related issues with a REPLACEMENT or REFUND. Pls contact our OULUOQI support team at the first time if you got the defective item. 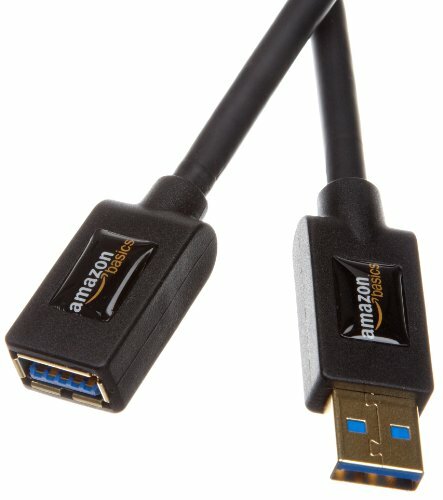 Reversible connector: This USB C cable keeps up with the latest trend of USB interface. This user-friendly design allows you to plug into all your USB Type-C compatible devices without worrying about the orientation of the port. Compatible With: Work with the new USB Type-C devices such as Samsung Galaxy S10, S9, S8,S8 PLUS,Note 9 8, LG G6,G5,V20, LG Nexus 5X , Huawei P9 Plus, Huawei P9, Huawei Mate 9, Google Nexus 5X ,Nexus 6P, Google Pixel, Google Chromebook Pixel, Lumia 950, Lumia 950XL, OnePlus 2,3,3T, ZTE Axon 7, Moto Z2 play, HTC 10, Nokia N1, Asus Zen AiO, Lenovo Zuk Z1, Nintendo Switch and other usb type c cable device. 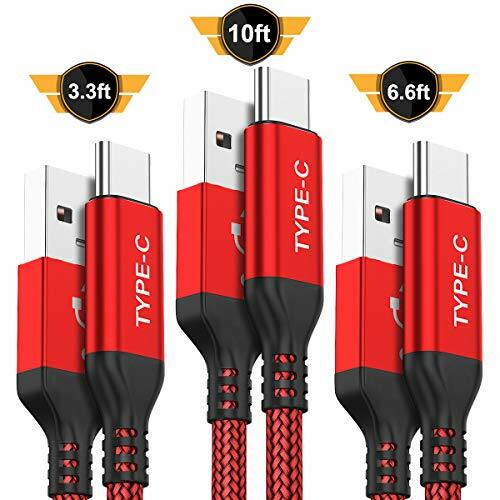 Tangle Free: Flexible Premium Long Tangle Free USB type C cable. 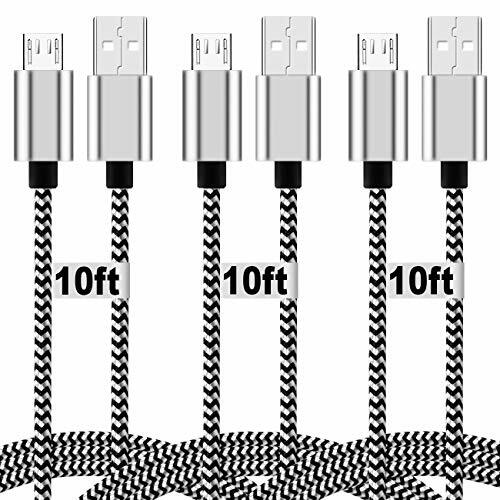 Durable Nylon Braided Fabric with superior aluminum housing make charger cables Oxidation resistance. Fast Charging & HIGH SPEED Data Sync: International safe certified and high Quality Rapid Charging at 2.4A Maximum, Quick connect and High speed Data Transfer speed up to 480Mb/s helps you work efficiently. 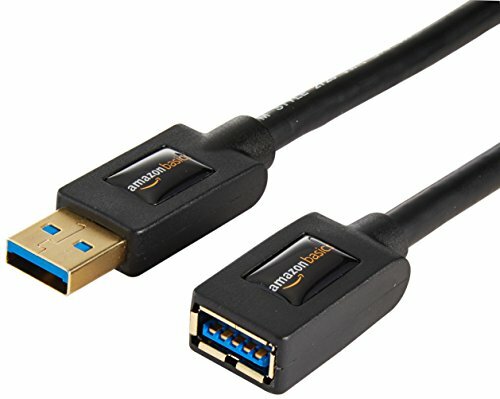 What You Get: 3 Pack 6ft USB C Cable with one adapter and 18-month Warranty,we take care of all quality-related issues with a REPLACEMENT or REFUND. Pls contact our OULUOQI support team at the first time if you got the defective item. Industry leading high speed charging & data transfer. Charge faster than many standard cables, support a high-speed USB 2.0 data transfer rate of up to 480Mbps. The Micro USB cable is covered with extra sturdy nylon jacket, which prevents it from damage, tangles and kinks caused by over - charging and daily usage. The well - built aluminum connector resists heat and corrosion and fits every case. The Aluminum-shell connectors ensure its superior functionality under heavy usage. If you have any problems, don't hesitate to contact us. We guarantee you a joyful shopping experience. WARRANTY:If you have any problems, don't hesitate to contact us. We guarantee you a joyful shopping experience. 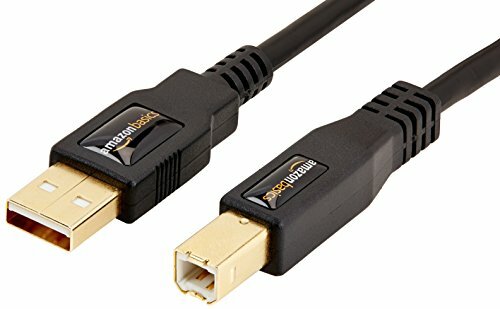 AmazonBasics USB 2.0 A-Male to B-Male Cable (16 Feet/4.8 Meters) An Amazon Brand. 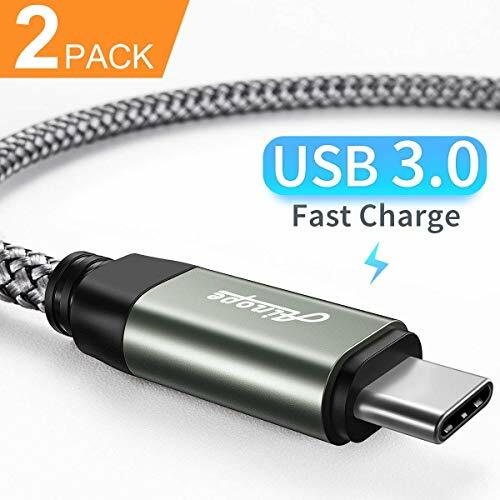 [Certified USB 3.0 Fast Charging & Sync Speed]: AINOPE USB 3.0 cable accelerate the speed by delivering 5V/3A safe charging current (40% faster) and 5Gbps data transfer rate (10 times faster) compared with USB 2.0 cable which provides 5V/2.4A current and slow data transfer rate (480Mb/s). 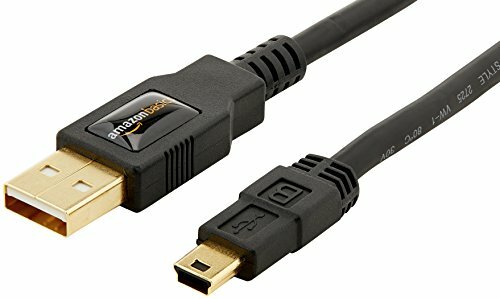 *Please note: 1-this cable can charge Google pixel 2/3/3XL normally, but it may not deliver fast charging speed. 2-Not support with Dash Charge. [Reinforced Cable Joint]: With 12,000+ times bend test, the solid and durable double-braided armor nylon shield offer the cable longer service life and will never rupture. The reversible connector is designed to keep up with the latest trend of USB interface (Type-C) and offer friendly user experience. [Superb Material& UL Certified Safety]: Tinned copper wire features anti-oxidation and anti-rust, will keep long-lasting fast charging performance and even survive your pet's chewing. This Type c cable fast charging has UI certification, you have no need to worry about this cable quality at all. [What You Get]: At AINOPE, you will get 365 Days MONEY BACK Guarantee and LIFE TIME Customer Service. 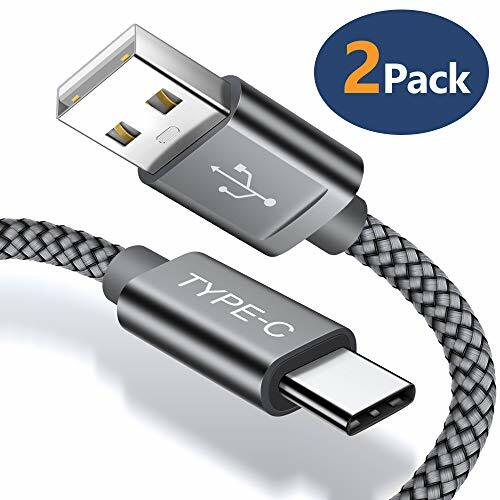 2x USB Type-C Cable, 2x Velcro tie, 1x Retail Package *Reminder* This cord alone WILL NOT provide you with fast charging alone, you will need a power block rated for fast charging and a phone capable of the same together. 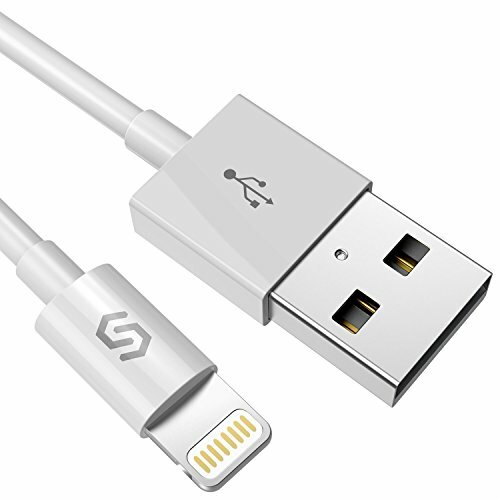 Apple MFi certified - Certified by MFI and built with Apple's original C48 terminal and smart chip, Sync wire iPhone charger cord with original 8 Pin connector ensures lightning-fast data transfer, syncing, and charging for your devices (Support Max 2. 4A charging current). Ultra Durable iPhone charger - Sync wire iPhone cable coats with high quality plastic cloth jacket and is filled with ultra-durable aramid fiber core which ensures an unparalleled 12000+ bend lifespan (several times stronger than original apple cables). Super Fit - Designed to fit into all cases including Life proof & Otter box Cases. Multi-Protect Safety System - Our lightning cables are tested on at least 3 different Apple devices to ensure that the quality of your charging experience is never compromised. It also passes the UL CE FCC certification to ensure the safety of you and your devices. Remarkable apple charger for Outdoor - Double shielding and tangle free design significantly enhance the interference protection to cope with any outdoor activities. The anodized connectors ensure superior functionality under heavy usage. Perfect Compatible iPhone Cable - Made for iPhone, iPad and iPod. Support iPhone Xs / Xs Max / XR / X / 8 / 8 Plus / 7 / 7 Plus / 6s / 6s Plus /6 Plus / 6 / SE / 5s / 5c / 5, iPad Air / Air 2, iPad mini / mini 2 / mini 3 / mini 4, iPad (4th generation), iPad Pro 10. 5-inch / iPad Pro 12. 9-inch (2nd Generation) / iPad Pro 12. 9-inch (1st Generation) / iPad Pro 9. 7-inch, iPod Nano (7th generation), iPod touch (5th generation) and iPod touch (6th generation), Beats Pill+. (Not compatible with iPad Pro 12. 9 inch 3rd generation , iPad Pro 11 inch). Premium Support - Each product from Sync wire is backed with 3 year and lifetime tech support. Please feel free to contact our customer service for any problems you have encountered and we are pleased to serve you to your 100% satisfaction. Warranty: Premium Support: Friendly warranty support without any other costs needed. Fast and easy-to-reach Customer Service to solve your problems within 24 hours. 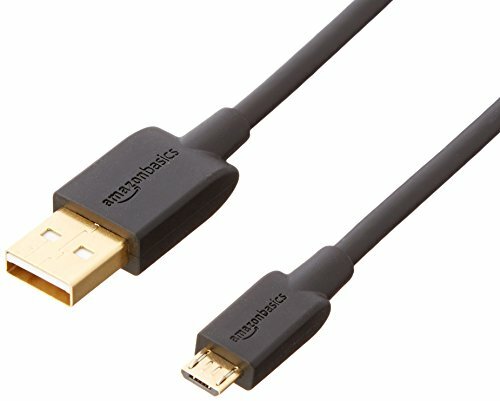 Use any phone charger, portable charger or multi-port USB charger to charge your new MacBook, ChromeBook Pixel, New Nokia N1 tablet or other USB-C devices via this cable. The reversible design of the USB C connector helps you insert the cable in a right way all the time. The Stylish & Tangle Free Design, which is easy to storage and durable for use. Features Tough yet Flexible Nylon Braided Jacket, Gold Aluminum Connectors. At iAlegant we believe in our products. That's why we back them all with a 18-month warranty and provide friendly, easy-to-reach support. USB 2.0 Fast Data-Sync & Charging: Supports safe high-speed charging (5V/3A) and fast data transfer (480Mbps). Conforming to the USB Type C Specification version 1.1, 56kilohm, which ensures a safe charging at 2.4A Maximum. Reversible Connector: Keeps up with the latest trend of USB interface. This user-friendly design allows you to plug into all your USB C compatible devices without worrying about the orientation of the port. Last 10X Stronger and Perfect: Encased with Triple-Braided Nylon fiber, which make it have excellent anti-twisting & Abrasion-proof property. 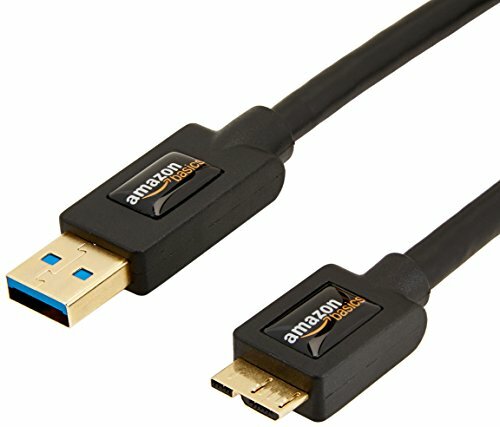 This USB Type C Cable can withstand at least 7,000 cycles of 90 degree bend test. Ideal for your heavy daily use. With the length, you can lie on the couch or sofa and use your devices while you are charging at the same time. Usb-C Compatibility: Compatible with Samsung Galaxy S10/S10e/S9/Note 8/9/S8/S8+, Razer Phone, Google Pixel 2/Pixel/Nexus 5X/Nexus 6P, LG V30/V20/G6/G5, Sony Xperia XZ, Huawei Honor 9/8, Motorola Moto X4/Z2, HTC U11 and all USB C compatible phones and tablets. 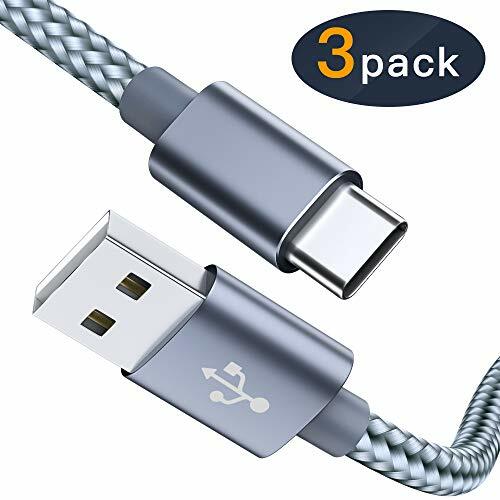 WARRANTY: We provide this Nylon Braided USB 2.0 Type-C Cable with 18-Month Warranty and 24/7 customer service, if you have any questions,we will resolve your issue within 24 hours. Constructed from neither plastics nor Polycarbonate sheathing, but has an especially high tensile nylon shell. The cable is properly circled by the nylon fiber cloth,which brings superior durability and flexibility as well. Nylon fabric can resist water in some way, but do not put it in water on purpose. High-Quality Copper Core ensures your devices are syncing and charging simultaneously and 100% fits for more deices. Connecting the phone charger cable cord to your devices and make sure the USB connector connect to the wall charger or computer. 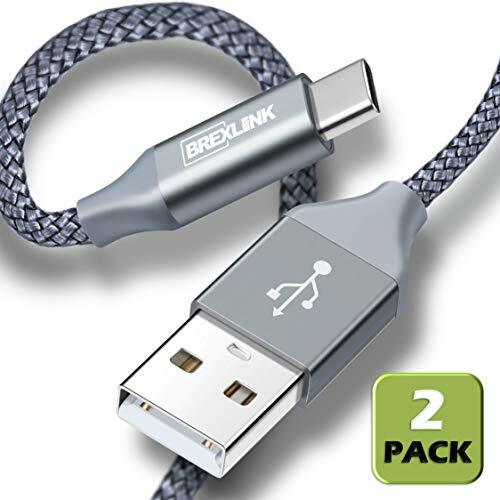 This nylon-braided fast charging cable is with aluminum shell and is more flexible, preventing your cables from tangling and sturdier and durable than most normal device cables. Note: Power output should not be above 5V, 2.4A or 6V, 3A when charging your phone with this charging cord. We are here to help you solve any problems within 24 hours. Fast charge -- high-quality four-core copper wires enhance charging & data transfer speed of the iphone lightning charger cable. Our technology ensures a faster charging time while keeping your device completely safe. Easy to carry, it suits every occasions, home, office, car and so on. 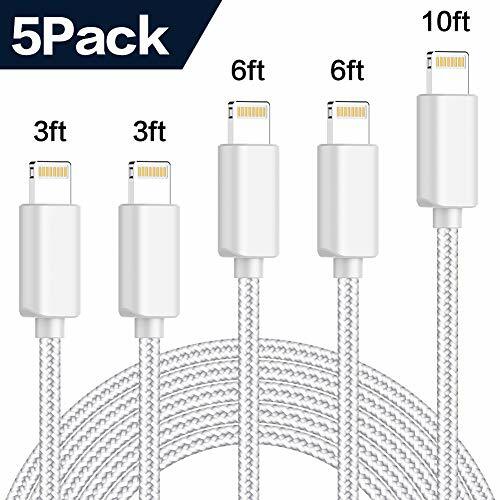 Universal Compatibility: compatibility with iPhone XS/XR/XS Max/ iPhone charger cable, iPhone X, iPhone 8 / 8 Plus, iPhone 7 / 7 Plus, iPhone 6s Plus / 6s / 6 Plus / 6, iPhone 5s / 5c / 5 / SE, iPad Pro / iPad Air / Air 2, iPad mini 2 / mini 3 / mini 4, iPad 4th gen, iPod Touch 5th gen / iPod Nano 7th gen.
What You Get: our worry-free 12-month warranty and friendly customer service. Data Hi-speed Transfer and Power Fast Charging 2 in 1. Transfer data speed up to 480Mbps, this allow you to download an HD movie or 1000 songs every 5 seconds. Charging speed up to 2.4A, this allow you to charge your phone in the fastest way. Built-in 56k? Pull-up Resistor, protect your device from potential danger. Reversible and can be plugged in both ways, insert the cable in a right way all the time. Sturdy braided-nylon fiber jacket and anodized aluminum shell make this Micro USB Cable more durable, more flexible and sturdier than the normal ones. - other Micro USB devices. [High Speed Charging and Sync]: Micro USB Cable Transfer speed up to 480Mbps, 2.4A Charge, Data Transfer and high speed Charging 2 in 1. [Nylon Tangle-free Design]: Tangle-free Nylon Braided Design, make the Micro USB Cable more sturdier than others. Premium nylon braided adds additional durability and tangle free with 10000+ bend lifespan. [Perfect 6.6FT]: With the perfect 6.6fT length, you can lie on the sofa and use your devices while you are charging at the same time. Allow you to be use freely in bedroom, office and even in the backseat of your car. 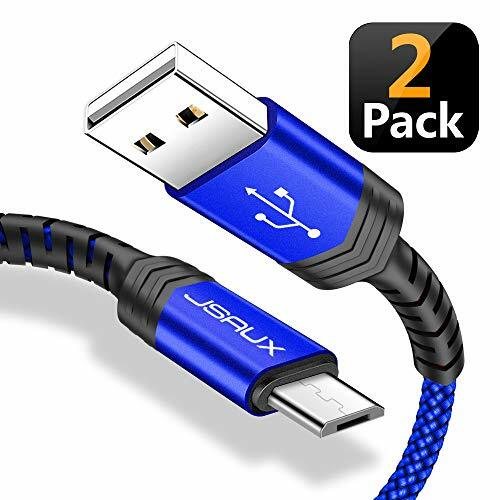 [Compatibility List]: This Micro USB Cable can high speed charge and sync well compatible with Samsung S7/S7+/S6/S6+ Edge/Note 5, HTC, Motorola, Nexus, Nokia, LG, Huawei, Sony, Blackberry, Kindle, Android smartphones, Xbox, PS4, MP3 and all devices with Micro USB connector. [18-Month Warranty]: We provide this 6.6ft Nylon Braided Micro USB Cable with 18-Month Warranty and friendly 24/7 customer service.